Install Winetricks – a helper tool which downloads and installs things automatically for Wine. Next up, we’ll install the official version of Steam – the --no-isolate parameter makes sure that Steam is installed in the shared wine environment. 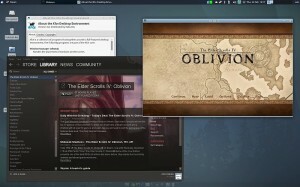 That will download and install Steam and a few other libraries – follow through the installer then let it run and log in. Easy peasy! After you’re sure Steam itself is working (don’t try and run any games yet), exit Steam. and press enter – that adds the Ubuntu Wine repository to your apt sources list, and gets the GPG key for it too. 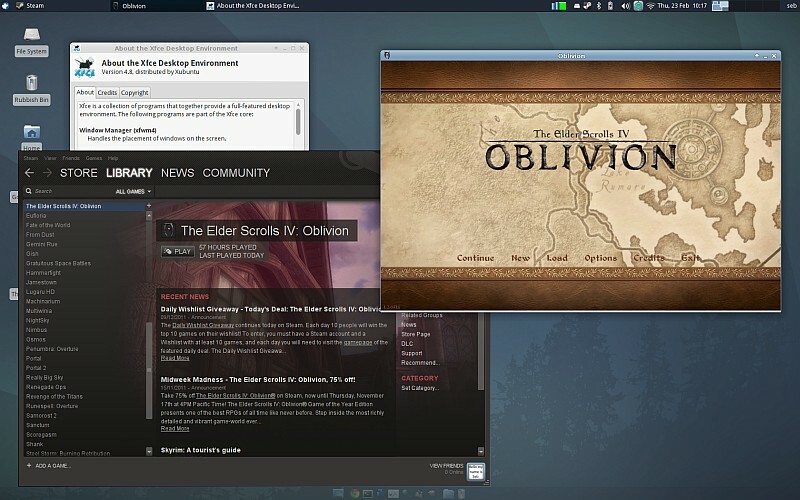 This works brilliantly on my laptop to play Oblivion – it’s a tiny bit slower than when run natively under Windows, but I just turned down a couple of the graphics settings and it’s all great. If you have any issues with sound (sometimes it cuts out) then setting Audio -> Direct Sound to “emulation” apparently fixes it.